This instrument was built around 1980 from a kit manufactured by Zuckerman Harpsichords. Around 1999, it was purchased as a used instrument, and the new owners wished to improve its looks. When it arrived it was painted a sort of brick red, and the soundboard had never been painted. After stripping it, I began by creating an original soundboard painting in the early 17th century Flemish style, working from engravings of birds and flowers used by the artists then. The soundboard is painted with gouache, and I chose to use only 17th century pigments. The case is decorated with strapwork over a dark blue ground. The base color is oil-based japan color, and the strapwork is gouache. 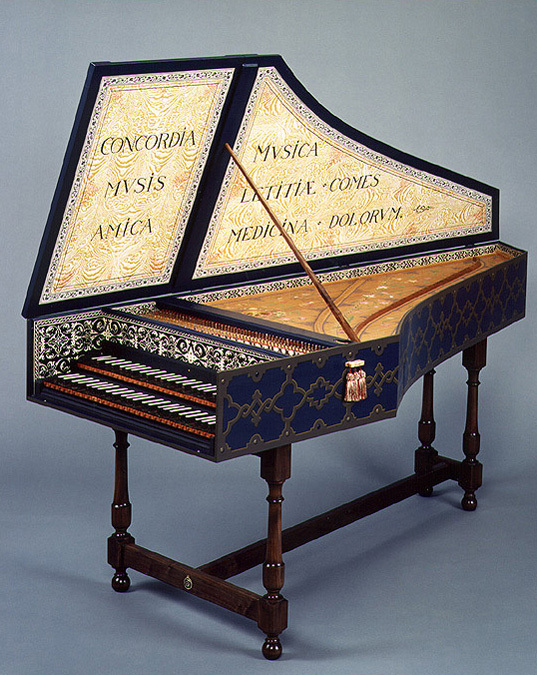 The keywell and soundboard surrounds are covered with block-printed papers, and on this instrument the inside of the lid is also covered with printed papers, one type imitating the grain of Hungarian ash, the other an arabesque design. Latin mottoes are painted on top of the papers, which is authentic to Flemish practice. These two mottoes, which were chosen by the owners but coincidentally appear on an Andreas Ruckers instrument dating from 1640 (Yale Collection), mean, "Harmony is a friend to the Muses" and "Music is the companion of joy, the medicine of sorrow." The latter inscription can also be seen inside the lid of the virginals in Jan Vermeer's painting "The Music Lesson" in the collection of HM Queen Elizabeth.